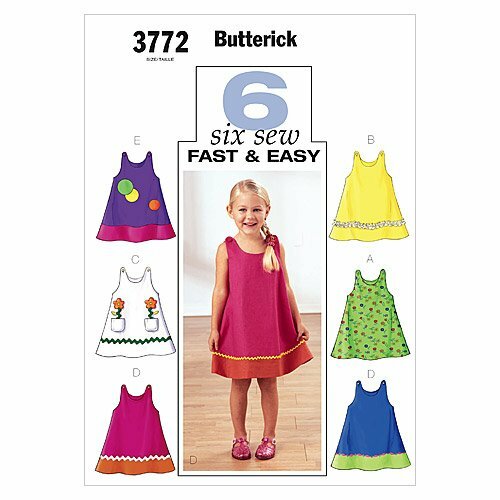 TODDLER'S & CHILDREN'S DRESS A-line, dress, above mid-knee, has button shoulder closing. B: self ruffle. C and D: purchased trim. C and E: contrast appliqués. D and E: contrast hem band. FABRICS: Lt.wt. Linen, Broadcloth, Lt.wt. Denim and Pique. Unsuitable for obvious diagonals. Allow extra fabric to match plaids or stripes. Use nap yardages/layouts for pile, shaded or one-way design fabrics. *With nap. **W/O nap. See pattern envelope for additional information.